KATHMANDU (2 December 2018) – Prime Minister KP Sharma Oli has asserted that the country could not advance in the path of economic development and prosperity in absence of good-governance and transparency. 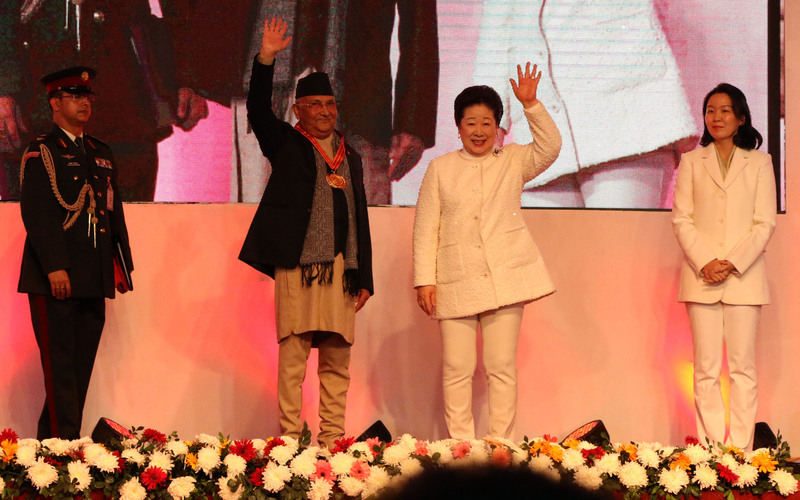 Addressing the closing ceremony of the Asia Pacific Summit organized by the Universal Peace Federation here today, PM Oli said that the incumbent government was working towards further institutionalizing the good-governance and the rule of law. Calling for cooperation from all quarters in the government’s drive to ensure good-governance and to curb corruption, Oli assured that the government was effortful to make good governance to be felt significantly by the citizens through the established values. Furthermore, he claimed the incumbent government was not giving in to any external influences and pressure and was keeping the government at the disposal of the citizens. The PM reaffirmed that the government has adhered to the universal democratic values, democratic values and rule of law as well as sovereignty vested in people. Prime Minister KP Sharma Oli said corruption does not only mean the financial embezzlement as it could be seen in policy level and misusing the power therefore all forms of corruption should be eradicated from the roots. He shared that government was adopting zero tolerance policy in regard to corruption case. On another note, PM Oli urged the people’s representatives to maintain transparency in their activities as they had roles of making democracy successful. Saying that the Asia Pacific Summit was successfully completed in the country, Prime Minister Oli urged the foreign visitors to visit Chitwan National Park and see the one-horned rhinos.